I woke up this morning with an enormous headache. One of those headaches that makes the world spin. I got out of bed, took some ibuprofin, threw some frozen waffles in the toaster for my son and crawled back under the covers informing my husband that he needed to do the school drop off this morning. A few hours and a little more sleep later, and I'm feeling better. The headache has left me feeling drained so I'm still in bed (watching all the fashion wrap ups from the Academy Awards last night) and hopefully able to concentrate enough to tell you about these wonderful little cookies. I wish I had a few left, but I finished the last of them last night while watching Billy Crystal poking fun at Brad Pitt and George Clooney. I could use a pick me up today and these cookies certainly fit the bill. I first spotted the cookies on a fellow bloggers site (thanks Authentic Suburban Gourmet). When I posted it a link to it on Facebook, a great friend of mine posted a comment in jest asking me when I was making them and sending the cookies her way. Although she was kidding I decided that was exactly what I was going to do. She lives in gray, rainy Washington and a pick-me-up was just what she needed in the midst of a Pacific Northwest winter. I baked up a batch and boxed them up with a dozen tangerines from my garden and sent her a taste of the California sunshine. The cookies went over so well, my lovely girlfriend requested another batch sent along with the recipe so she could make them herself. And I made enough the second time to keep some for myself. They're good, really good. And actually they're even better the second day if you can resist them enough to last that long. 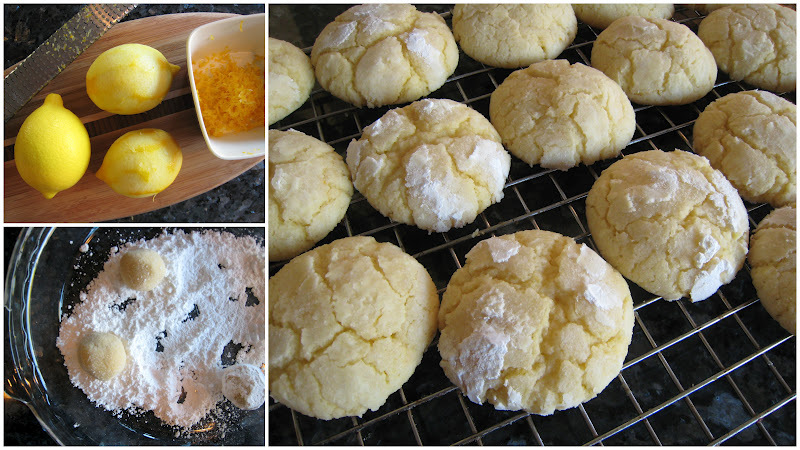 The lemon flavor develops and permeates the entire cookie when you let them sit overnight. That also makes them a great cookie for sending if you, too, have a friend or family member who needs a late winter pick-me-up. Makes about 32 cookies. Adapted slightly from Authentic Suburban Gourmet. Preheat your oven to 350 degrees and line 2 baking pans with parchment or spray with non-stick spray. In the bowl of a mixer, beat together the butter and the 1 cup sugar until light and fluffy. Add the egg, lemon zest and juice and mix until well combined. Add the dry ingredients and beat until just mixed. Place the two sugars into two separate bowls. Scoop the cookies by heaping teaspoons. Roll each cookie into a ball and drop into the granulated sugar. Roll in the sugar and then roll in the powdered sugar. Place the cookies on the prepared cookie sheets in 4 rows of four. Bake for about 10 minutes or until the cookies no longer look shiny and the bottoms are lightly browned. Cool on a baking rack. The cookies will keep for several days in an airtight container. As with many of us, the heart of my home is my kitchen. I live with three men (one grown and two little ones), and our favorite time of day is sitting down to great meals eaten together at our family table. The recipes you see here are a presentation of my own heart to you. My Sister's Beautiful Etsy shop! So, please, leave a comment below- I will absolutely read it. And of course, I will do my best to respond to each of you. Thanks!